« Two New Vancouver Condo Listings – The Crosstown Crane Building & The Lofts on West 11th Avenue Vancouver! We are currently down to our last dozen homes at the downtown Chinatown/Crosstown GINGER Vancouver condos for sale and have a great selection of 1 and 2 bedrooms available. 1 bedroom homes starting from $319,900 and 2 bedrooms from $459,900. No HST applicable when you move in prior to July 1, 2010 – just in time to enjoy the sunshine on your large outdoor balcony here at GINGER Vancouver condo living. Buying your first new Vancouver home has never been so simple with our great rent to own program! With 2.5% down your dreams of owning downtown Vancouver real estate can become a reality. We have 2 fully furnished GINGER Vancouver condo display homes available for you to view daily from 12-5pm (closed Friday). Attached is a Vancouver Sun Article that may help you in your decision to become a home owner at Ginger. Yours Truly, GINGER LIVING SALES TEAM – DISPLAY SUITE LOCATED AT 718 MAIN STREET. P.S. 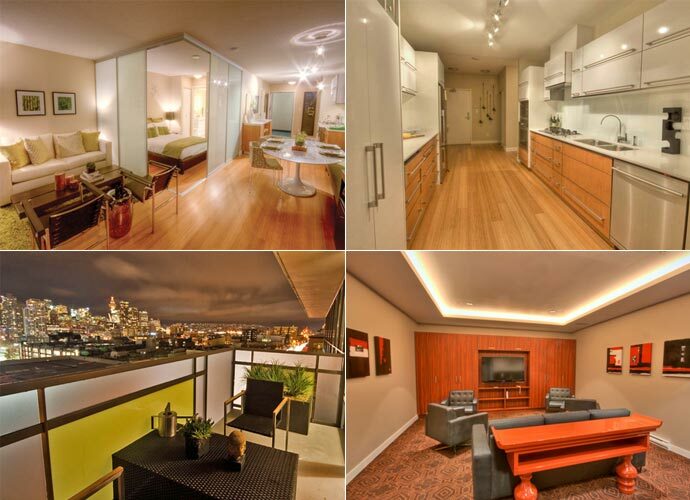 Our downtown Vancouver GINGER penthouses are ready to move in and priced from $599,900 no HST prior to July 1, 2010. Don’t miss out on this incredible savings. Great Downtown Vancouver Real Estate Value Still To Be Had At GINGER Chinatown Condos for sale! The newly completed homes at Ginger Vancouver downtown condos in Chinatown/Crosstown neighbourhood are great value and should be first on your hit list of homes to purchase for any first time homebuyer single or couple. We have the following new Downtown Vancouver condo suites available: 1 bedrooms Ginger Chinatown condos now starting from $319,900 to $399,900 with 2 bedrooms layouts starting from $459,900 to $479,900. The spacious 2 bedroom Ginger Downtown Vancouver Penthouses for sale feature open concept floorplans and are now priced from $599,900 to $805,900. At these incredible downtown Vancouver real estate prices the few remaining Ginger condo homes won’t last long. In addition, the Banks Announce Largest One Day Rate Increase in 14 Years! Today, major lenders announced that they will be increasing mortgage rates on some fixed terms by more than .5%! This is noted as the largest one day rate increase in 14 years. Tomorrow morning would be a good time to either update your current mortgage rate hold or get a rate hold from your bank or lender if you are interested in purchasing a new Chinatown Ginger Vancouver downtown condo for sale. “Royal Bank, TD Canada Trust and Laurentian Bank announced Monday they are raising rates they charge on certain fixed mortgages, including the benchmark five-year mortgage, which will jump 60 basis points to 5.85 per cent effective Tuesday.” – Tim Shufelt, Financial Post. The goal post has been moved for Canadian First Time Home Buyers starting April 20th as well. After this date, if you are interested in purchasing a new downtown Vancouver condo for sale at the Chinatown Crosstown Ginger real estate development, you will now have to qualify based on the 5 year posted rate, which is today at 5.25% and the current qualifying rate is 3.75%. This means that your purchasing power will go down after April 20th. We would be happy to refer you to a mortgage specialist at RBC who can discuss how these changes and many others will affect your Ginger Vancouver downtown condo purchase today and in the future. The Crosstown Ginger Vancovuer condo presentation centre is still open daily from 12-5pm (closed Fridays) and they feature 2 fully furnished display homes available for you to view, so it is worth your while coming down to see us. The Ginger Chinatown Vancouver Condo DISPLAY SUITE LOCATED AT 718 MAIN STREET.